A garden that has expanded over hundreds of years but retained each generations work. Mount Edgcumbes gardens are possibly unique in this. Explore the gardens moving through layers of gardening history from the 16th century to our modern Black Bee Reserve. Through generations of the Edgcumbe family, and as their wealth increased, they added to the House and also created a landscaped park and new pleasure gardens. The area of these more formal gardens covers around 7 acres stretching from the lower park at Cremyll to the area of the Earls Garden which surrounds the House. In the lower gardens you will find:– The Italian Garden, The French Garden, The English Garden, The Fern Dell, The Jubilee Garden The New Zealand Garden, The American Garden, The Rose Garden, The Relic Garden, The Bee Garden. 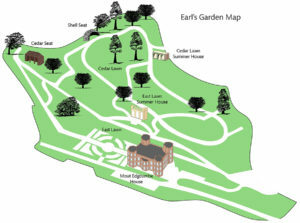 The Earls Garden surrounds the House. The Deer Garden can be found opposite the Barrow Centre with The Knot Garden overlooking the Avenue. Created at the end of the 18th century, the garden was an informal mix of trees, shrubberies and flower beds in a style reflective of the ‘natural’ English landscape. However for the eagle eyed amongst you, you will notice that some of the trees and shrubs planted at the time, and still surviving today, were not in fact native to this land including cork oaks, magnolias and palms. A Regency period creation of around 1803, the garden contains geometric flowerbeds which are defined by well trimmed box hedges. In the most prominent position you will find a beautiful shell fountain. The form of the garden you see today was originally laid out around 1785. The garden is centered around an impressive mermaid fountain, a gift from Lord Bessborough to his god son, the second Earl and has four circular beds. Originally planted with herbaceous plants, they now contain bedding plants in the Victorian style. To mark the family connections, the New Zealand Garden was created in 1989. With a geyser as its centerpiece and architectural plants making a striking display this garden is a little piece of New Zealand in the West Country. Established to acknowledge the American Forces who were stationed at Mount Edgcumbe during the Second World War and who left here for the beaches of Normandy in 1944. The American Garden is a beautiful place to sit and reflect, shaded by a pergola covered in Virginia creeper and surrounded by dwarf conifers. Created beside the Tudor House in the 18th century this well established garden contains ancient and rare trees including a 400 year old lime, a splendid Lucombe oak, and a Mexican pine. Set amidst classical garden houses and an exotic shell seat, colourful flowers and heather grace the recreated Victorian east lawn terrace, which has spectacular views over Plymouth Sound. You will feel like you have entered another world in this peaceful garden. Surrounded by architectural palms and shrubs this area, also known as the pet cemetery, was a favourite of the family and now houses some of their faithful friends. Created in 2002 to commemorate Queen Elizabeth II Golden Jubilee, the garden is framed by bay hedges, clipped yew and hornbeam. The centerpiece of the garden is a modern sculpture by local artist Kevin Deery called ‘Sound’. In 2011 a new formal garden was designed and created by the staff at Mount Edgcumbe to utilize the discarded stonework and garden ornaments that had been scattered throughout the Park over the years. Designed in 2015 by the foreman gardener here at Mount Edgcumbe the Deer Garden was created to celebrate the 500th anniversary of Henry VIII granting Sir Piers permission to empark his deer. The garden was funded by a donation from the Friends of Mount Edgcumbe and officially opened by Robert, 8th Earl of Mount Edgcumbe. Reclaiming part of the park that once stood beneath the dining room of Mount Edgcumbe House prior to destruction caused by the incendiary device during WWII, this garden was designed by the park’s foreman gardener and created by the gardening team and volunteers at the park. In the style of an Elizabethan Knot Garden, this 2016 garden celebrates the year of the Queens 90th birthday. Originally created in the early 18th century The Rose Garden would have been a flower garden. There still remain structures that would have been green houses and frames where flowers would have been “brought on” for use in the House. The present rose garden was created in the 1970s and contains a range of David Austin old English Roses. 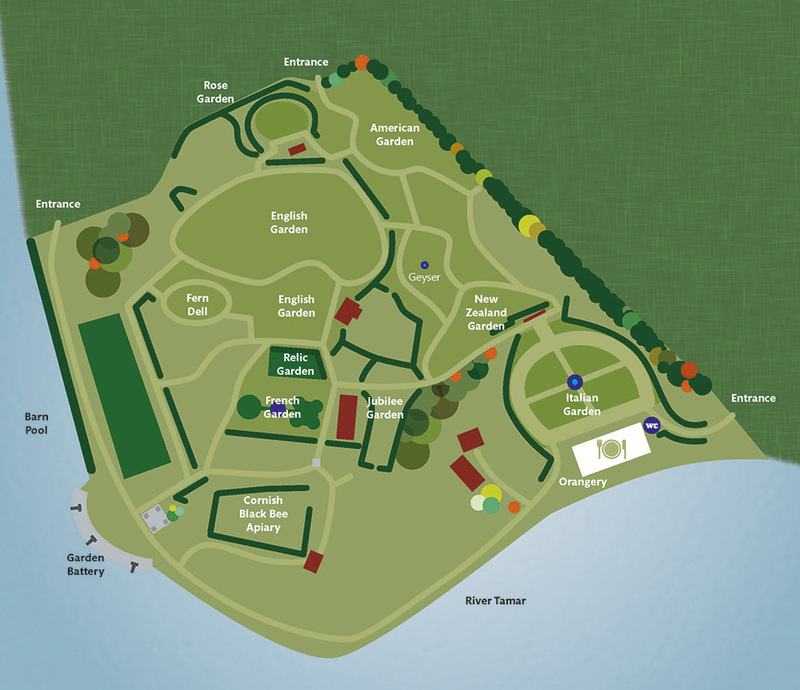 Created by the Mount Edgcumbe team in 2017 (supported by the B4 project and the Tesco ‘Bags of Help’ community grant scheme) the Mount Edgcumbe Black Bee Reserve is the first of its kind in England. The reserve combines bee hives with an observation centre and clever planting to provide the bees with sustenance year round – it also fits in and around the original frame garden to reflect its use in an earlier period.